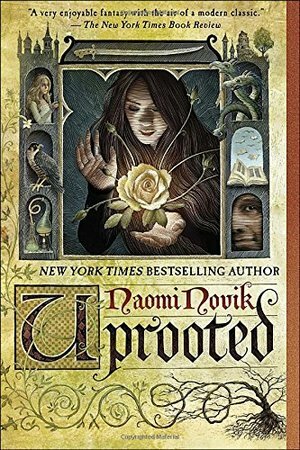 NAMED ONE OF THE BEST BOOKS OF THE YEAR BY NPR | BuzzFeed | Tor.com | BookPage | Library Journal | Publishers Weekly • Naomi Novik, author of the New York Times bestselling and critically acclaimed Temeraire novels, introduces a bold new world rooted in folk stories and legends, as elemental as a Grimm fairy tale.“Uprooted is confidently wrought and sympathetically cast. I might even call it bewitching.”—Gregory Maguire, bestselling author of Wicked and Egg & Spoon “Our Dragon doesn’t eat the girls he takes, no matter what stories they tell outside our valley. We hear them sometimes, from travelers passing through. They talk as though we were doing human sacrifice, and he were a real dragon. Of course that’s not true: he may be a wizard and immortal, but he’s still a man, and our fathers would band together and kill him if he wanted to eat one of us every ten years. He protects us against the Wood, and we’re grateful, but not that grateful.” Agnieszka loves her valley home, her quiet village, the forests and the bright shining river. But the corrupted Wood stands on the border, full of malevolent power, and its shadow lies over her life. Her people rely on the cold, driven wizard known only as the Dragon to keep its powers at bay. But he demands a terrible price for his help: one young woman handed over to serve him for ten years, a fate almost as terrible as falling to the Wood. The next choosing is fast approaching, and Agnieszka is afraid. She knows—everyone knows—that the Dragon will take Kasia: beautiful, graceful, brave Kasia, all the things Agnieszka isn’t, and her dearest friend in the world. And there is no way to save her. But Agnieszka fears the wrong things. For when the Dragon comes, it is not Kasia he will choose.Praise for Uprooted“Uprooted has leapt forward to claim the title of Best Book I’ve Read Yet This Year. . . . Moving, heartbreaking, and thoroughly satisfying, Uprooted is the fantasy novel I feel I’ve been waiting a lifetime for. Clear your schedule before picking it up, because you won’t want to put it down.”—NPR “A very enjoyable fantasy with the air of a modern classic . . . Naomi Novik skillfully takes the fairy-tale-turned-bildungsroman structure of her premise . . . and builds enough flesh on those bones to make a very different animal. . . . The vivid characters around her also echo their fairy-tale forebears, but are grounded in real-world ambivalence that makes this book feel quietly mature, its world lived-in.”—The New York Times Book Review “Novik here delivers a tale that is funny and fast-paced, laced with hair-raising battle scenes and conspiracies; it also touches on deeper ecological concerns we grapple with today.”—The Washington Post “Novik takes us on a surprise-filled journey. . . . The resulting warmth and intimacy provide a nicely nurturing environment for her heroine’s unusual adventures.”—The Seattle Times “Breathtaking . . . [Novik] weaves a tale that is both elegantly grand and earthily humble, familiar as a Grimm fairy tale yet fresh, original, and totally irresistible. This will be a must-read for fantasy fans for years to come.”—Pubilshers Weekly (starred review) “An original and fully realized fantastical place guaranteed to enthrall her longtime fans and attract new readers.”—Library Journal (starred review)From the Hardcover edition. Very easy, quick, and fun to read. Engaging and entertainment. Top quality among YA fantasy genre.